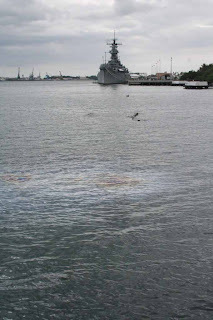 More than 65 years have passed, and oil still comes to the surface from the USS Arizona, a poignant tribute to the 1,100+ Sailors and Marines entombed in her on 7 December 1941. So many years later, the poignancy is slipping away ... 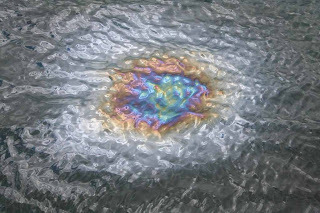 I heard a younger voice ask a parent if the oil leak would harm the environment. Visitors are nowadays briefed by a National Park Service film at the visitor's center .... the film gives a somewhat balanced view of the events leading up to the attack and why it happened, a somewhat tasteful portrayal of the history. The visitor's center, unfortunately, is falling apart and is in desperate need of support. The Partnerin was surprised no admission was charged and didn't think twice about dropping $20 into the collection box to aid the maintenance of the center. I didn't plan on visiting the memorial, having already been there a few times before ... The Partnerin suggested we see it. I first saw it in the mid-1970's with my Grandmother and a boat load of that generation that lived through the war. It was a much more personal story to them. The crowd nowadays is still for the most part respectful, but you can really sense much more detachment ... when I was young it was already a lifetime away. For many it is three generations past and now less than a quarter page in a high-school history text. 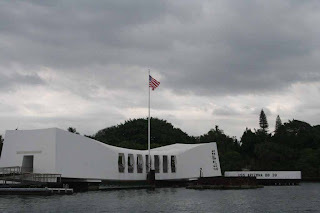 There are still a few Pearl Harbor survivors working as volunteers at the Visitor's Center, telling their stories and those of their long lost friends to the still-listening crowds. Many of these old guys still feel guilty to have survived. Some were on leave, others on shore, and a few were simply lucky. Survivors always feel like they cheated death, but it is only fleeting, and their numbers are fewer every year. Since then, the USS Missouri has been moved to the site, but it apparently created controversy, with many worrying that such a grand Battleship would detract from the significance of the Arizona. The compromise was to distance the Mo and to face her bow to the Arizona, as if to say she is watching over her and those who found their last resting place in her. I think you are right, Mike. So many of the younger generation do not understand or appreciate. It is true that it is difficult for anyone (not just us of the 'younger' generation) to understand or appreciate the intensities of emotions towards a particular event in history, especially the farther they are away in space and time. In 2067, how will the events of 11 September 2001 be viewed by those who were not alive to feel and see the effects and changes it had on the world first hand? Probably no more or less detached than how Pearl Harbor is viewed by many today. The detachment does not make it any less important of an event in history, it just illustrates the effect that time has on a people's memory and capacity to hold strong emotion. Maribeth: I'd like to say it was like the Civil War or Revolutionary War for us, but I recall the significance of both being drummed into us. emh: They say that history starts for most people when they are born. A lot of truth in that. As for 2067, I'll certainly be detached around then. A friend's father (much older) was a survivor and those stories hang with you. My father is also old enough to remember, but I don't think most people my age got as much exposure to the 40's as I did.